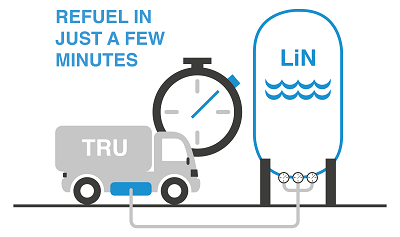 The Dearman TRU is powered by liquid nitrogen and seeks to displace incumbent diesel TRUs. The refueller can be quickly installed at distribution depots planning to take up Dearman TRUs – it takes just a day to get up and running. Hassle-free set-up is a key selling point of the Dearman system. The new liquid nitrogen refueller works just like a diesel pump, meaning drivers do not need to learn unfamiliar practices. Users just connect the nozzle, simply press a button and the dispenser does the rest, stopping automatically when the Dearman TRU tank is full. A full refuels takes less than ten minutes. The Dearman TRU has already been deployed in the fleets of Sainsbury’s, Unilever and Marks & Spencer. Commenting, Dearman’s Head of Cryogenics, Chris Owen, said: “We’re delighted to unveil the new Dearman liquid nitrogen refueller, developed with our partners at Air Products. It’s very user-friendly for fleet operators and it certainly reduces any anxieties there may be about switching to new technologies. Above all, it’s completely safe for the operator.